Poplar Lake, also known as Klarvatten Wetland, is a productive and diverse wetland that supports many wildlife species, particularly waterfowl. The presence of open water, cattails and upland habitat makes the site an excellent location for waterfowl to nest, feed, and rear their young. Many birds also make a stop at this lake to rest and feed during their long journey between their winter and summer breeding grounds. The fringe of willow between the lake and 82nd St. as well as a small clump of aspen trees, rose, and native grasses in the northeast corner provide some habitat for upland species. This site has been completely conserved within the Klarvatten neighbourhood as a stormwater-influenced wetland and it is buffered with additional park space. The outlet is controlled to provide a range of water levels, to accommodate wetland function and wildlife habitat. 82 St. and 173 Ave.
Access limited to viewing platforms on western edge of wetland. 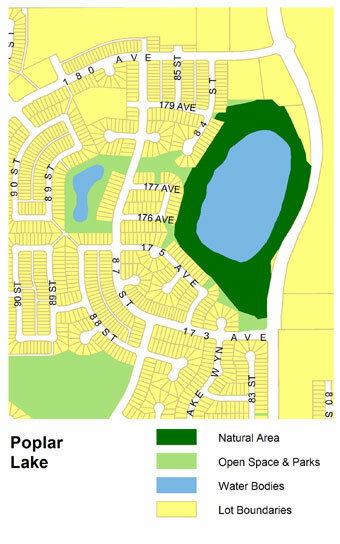 Poplar Lake is located in the Klarvatten Neighbourhood, in northeast Edmonton, west of 82 St. and north of 173 Ave. A pedestrian/cycling path system circulates the wetland and connects the neighbourhood sidewalks. The open water of this wetland is fenced and access to the wetland edge is not permitted at this site; however, there are two viewing platforms situated along the western edge of the wetland, which include seating, bike racks and interpretive signage. Parking is available along 82 St. along the eastern edge of the wetland. 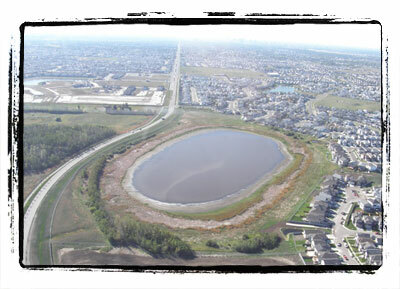 Poplar Lake is home to more than 21 species of songbirds, waterfowl, shorebirds and raptors. Take your binoculars!